It is rightly said that music as an art form is the sole language that is understood universally and also an entity, identified to be divinity even by atheists! Indeed, in such a scenario it is most credible for an artiste to achieve significant recognition on all fronts and make a mark in this enchanting world of music. On this score, it is interesting to note that by and large, this art is an inborn trait and runs in the veins of every other successful musician. One among such notable personalities is Delhi-based Ustad Saeed Zafar Khan who has earned name and fame as a Sitar artiste. Aptly, Ustad Saeed Zafar Khan’s credit could be attributed to his persona of belonging to the tenth generation of Indian classical music, the Hindustani genre in particular. Thus today, he is among the leading exponents of Sitar players of Delhi Gharana (school). He was born in a family whose home was nestled in the neighbourhood of renowned stalwarts of Delhi Gharana such as vocalists Ustad Chand Khan, Ustad Usman Khan, Ustad Hilal Ahmed Khan, and Ustad Nasir Ahmed Khan besides Sarangi artiste Ustad Bundu Khan and violinist Ustad Zahoor Ahmed Khan. Above all, Saeed Zafar’s father Ustad Zafar Ahmed Khan was a renowned Sitar artiste and also his Guru (teacher) who inculcated and enriched the musical traits in his son. No wonder, one can assume and presume that right from his days as an infant, instead of the traditional lullabies Saeed Zafar must have been hearing and relishing Khayals and Gats to such an extent he learnt melody and rhythm before knowing his mother tongue!! And naturally, in this unique environ of music, he was moulded into a gem of a Sitarist. To supplement these traits, he even mastered his style blends of Tantrakari (instrumental virtuosity) with flashes of Delhi Gharana Gayakas and Gayakis (vocalists). 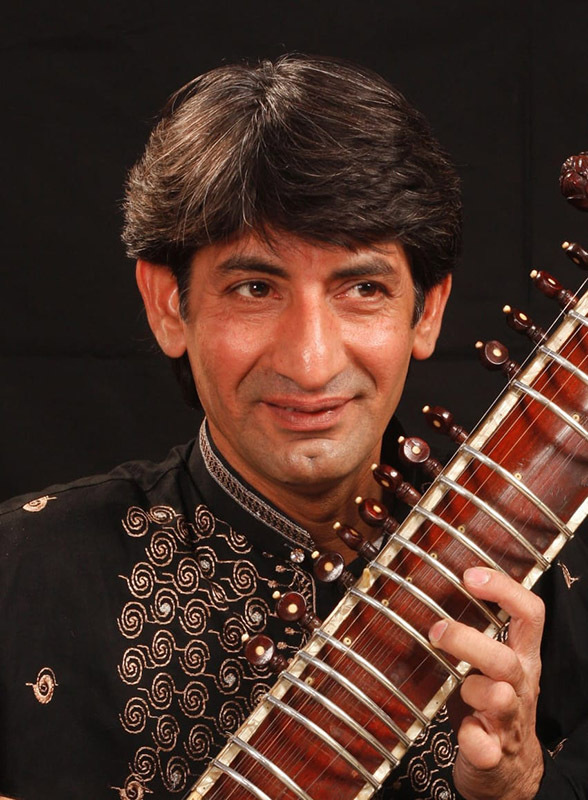 On these aspects, popular music critics have opined that Saeed Zafar’s Sitar Taleem (education and training) is home grown. They contend that the Sur, tone, mode of strike, plucking, Meend (technique of gliding from one note to another, known as Glissando in musicology) and Harkat displayed by him have been inspired by his father and Guru, the Sitar maestro Ustad Zafar Ahmed Khan. It is said that the father did put in lots of effort for his son Saeed Zafar to blossom into fine Sitarist. Today, what makes Saeed Zafar’s performance highly appealing is the remarkable blending of tunefulness, tonality, rhythmic patterns and Raagdari (treatment of the Raaga). Thus he has matured as a Sitar artiste and impressed with his neat phrasing and proportion and meditative Alaap (also known as Alapchari, it is the gradual unfolding and development of a raga by monosyllables sans any fixed composition) whose mastery is evident in the manner he organises Ragas systematically by using a succession of notes. All these have enabled Ustad Saeed Zafar Khan to emerge as a 'Top Grade ’ artiste of the country’s major media network of Akashwani (All India Radio) and Doordarshan (national television). Apart from this he has featured in numerous national programmes and the prestigious AIR Sangeet Sammelans. It is interesting to note that ever since making his stage debut of performance in public at the tender age of 7 years, he has never looked back regaling thousands of connoisseurs of Indian classical and traditional music at jam-packed concerts in India and abroad. Thus reads the saga of Ustad Saeed Zafar Khan and his eternal endeavour to enrich the legacy of Delhi Gharana with his artistry over the strings of that melodic instrument known as Sitar, a talent that he has inherited from his father and other ancestors, some of whom must have been the prized artistes in the courts of princely rulers of yore.